What's New? That's the million-dollar question in a multi-billion dollar industry! The answer? It's out there, if you look for it (wink, wink!). Here's a start. BE attended MakeUp in New York, a first time U.S. event held in the wake of the success of MakeUp in Paris. Answers to "what's new?" were found at this two day trade show. Beauty industry leaders had the opportunity to engage in firsthand conversations with suppliers, manufacturers, designers and trend forecasters. Innovative makeup ingredients, formulas, packaging, full-service development and design ideas were shared. Visionaries could walk away with fresh concepts to enhance and complete the coming year's product development and marketing calendars. Here's a quick look at what's new. EVE PEARL®, International Luxury Brand of Makeup presented their full line up of "good for your skin" color cosmetics enhanced with advanced nutrient technology. The latest launch from EVE PEARL® is High Definition Liquid Foundation. Developed in 9 shades from fair to deep, this lightweight, layerable foundation builds from sheer to full coverage. For light coverage, apply with a damp facial sponge. For full coverage apply with a foundation make up brush or finger tips. Works for face and body. The technology across all of Eve's formulations is CosmeNutrients®, a unique blend of vitamins, minerals, proteins, peptides and anti-oxidants. The powerful anti-oxidant, Astaxanthin derived from sea algae is formulated into all of the cream formulas. Packed with Omega-3, it provides anti-inflammatory properties and has been found to be more powerful than Vitamin E for protection against lipid peroxidation within the skin. EVE PEARL® is Makeup with Skincare for Every Complexion…at Every Age. Mascara Plus, a contract manufacturer based near Milan, Italy introduced an innovative lash formulation to their specialized line up of mascara formulas and brushes. WaterProof Glaze! is a semi-transparent, extra water proof, lash gel. Apply it to bare lashes as a top-coat for a natural glossy-lash look or apply it over a favorite mascara to make it waterproof. WP Glaze solves the problem of developing a volumizing mascara formulation with waterproof benefits. The secret; apply a favorite volumizing mascara to lashes then coat with WP Glaze for water-resistant, full, long, lush looking lashes. THE SAMPLING EDGE: Try it! 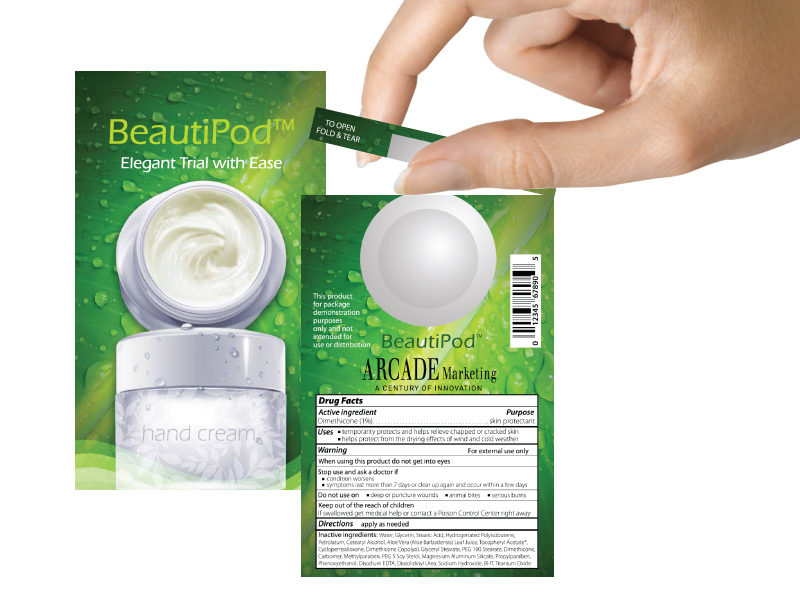 Arcade Marketing, a preeminent provider of sampling solutions to the world’s leading beauty, fragrance and skin-care brands introduced a number of new sampling methods. Their creative designs and manufacturing options help to promote specific product needs for sampling or retail sell through. BeautiPod™, available in two designs with a 1.5 gram fill weight. 1.) A round shaped sampling pouch or 2.) A streamlined, rectangular shaped pouch - Both hold viscosities that range from thinner serums to creamy foundations and are ideal for sample hand outs at counter, direct selling pieces, magazine inserts or sold as travel sized products. ShowerPods are planned to launch this Fall. These water-resistant sampling units were designed with a convenient hook feature to hang-in-the-shower for ease of use. A 5 or 10 ml. fill weight provides 2-3 applications of product. Great for business, overnight or weekend travel. ColorFixations are single trial samples that get customers fixated on your cosmetic color line up. Not only are they great for color sampling, they are fun to use. The peel off backing of the sample allows interchangeable colors to be applied to an in-store swatch sheet at the beauty counters so that customers can take the recommended shades home to use on eyes, cheeks and lips. A favorite of Marine Ravera's, marketing assistant at Arcade, is deluxe PowdaSilk™. Thesample system features a deluxe puff and powder foundation.. Fused together as one sample, the sponge applicator is on one side and the powder foundation or bronzer is on the other side of the sample. Different textures of powder puff applicators are available. Livcer - First time exhibiting in the U.S., this French company is the leader on Thermoformed sampling technology. Brand awareness is increased with this style of component sampling and studies reveal that 30% more customers will use and test samples that provide multiple use application versus a simple peel back, one time use packette. 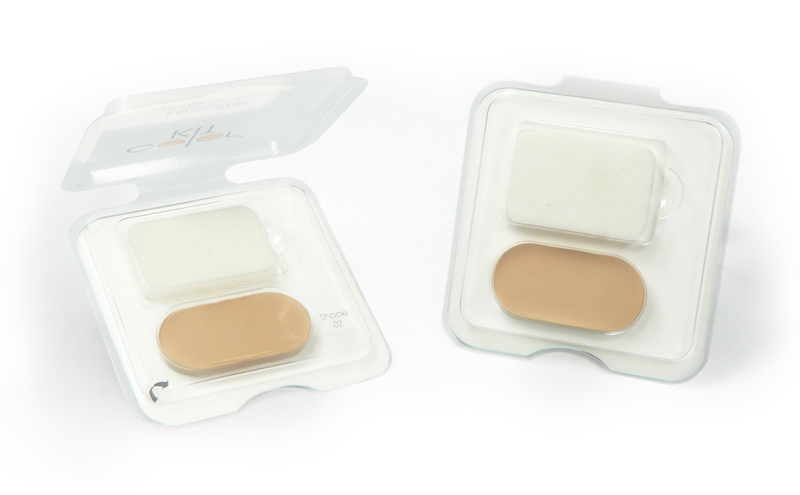 LipsKit ® launched this year and is a cost effective, direct fill sample system in an ultra thin resealable case. Since there is no need to create a mold with Thermoform technology, the lip formulas are hot poured directly into the sampling component molds. There is plenty of room on the package for branding and marketing copy. It's convenient, modern and easy for the customer to use and understand. ColorKit® launched just 3 months ago. The sample system provides ample amounts of color foundation or concealer and is accompanied by a sponge applicator. Innovative: Safety and ecological concerns were the main criteria for development. The built-in compartment case is filled directly with the product and fitted with a protective cap,thereby presenting shades attractively while ensuring product safety. Color Kit is entirely recyclable in keeping with their sustainable development policy. Practical: Color Kit is ultra-slim, resealable, contains one or more compartments (foundation and concealer, for example) and comes with a sponge. Color Kit is a smaller, bona fide makeup palette which offers a wide number of customization and decoration possibilities. It’s perfect for carrying in your purse, on the weekend or for short trips and respects customs and airline regulations and norms. Economical: Color Kit is cost-effective while guaranteeing a high-quality brand image. It can be positioned as a loss leader in your product catalogue thanks to its affordable price and as an introduction to your product range in the launch or relaunch phase. A favorite is the multi-color lip pallete sampling pack. Three lip color textures are sampled and there is plenty of room on the package to add branding, market copy and the line extension colors. Topline Products is a leading manufacturer of innovative beauty packaging and turnkey solutions. With locations in North America, Europe and Asia, Topline provides a truly global service offering packaging engineering, injection/blow molding, metal fabrication, product formulation, filling and assembly, supply chain management and R&D. Renowned for award winning design, Topline has been granted over 50 utility patents. In-Mold Labeled, Injection Molded Tube. Topline has created a strategic alliance with Viva Healthcare, an international manufacturing force, to bring this revolutionary tube to the market place providing the ultimate in decorated tubes. In-Mold label tubes provide a full color image from a tubed component's shoulder to crimp. The result, an immediate on-shelf product impact to the customer. The tube and label are molded at the same time creating an encapsulated label that reduces component scuffing and eliminates label peeling. It's Green: Materials have a recycling code of 5. It's Cost effective: The component manufacturing run is faster and less expensive because it is a single processes. It's Vibrant: Photographic imaging can provide up to 8 colors with or without metallic effects. MiniTreats! Need a mid-day mini treat? Try a flavored lip balm dispensed from a propel-repel miniature ice cream pint component. Double Tubing! Two tubes are better than one! The technology fill and component are breakthrough features for this lip gloss. Swirled gloss fills the inner tube and gloss boost fills the outer tube. High color intensity is applied to lips from the inner tube glosses and booster gloss formula in the outer tube offers a 3-d volume effect. Triple Swirled Lip Gloss! Triple the swirl means triple the fun! Triple technology provides a 3-dimensional visual and a tri-color application of gloss to lips. Two colored glosses are intertwined with a clear gloss booster that provides a tri-color application of high shine and volume to lips. Genealogy, LLC a full service Product Design House, located in Hackensack, New Jersey, opened its doors three years ago to provide full service product development from concept to finished product. The unique advantages of Genealogy is their boutique-like approach for cosmetic product development by providing branding, marketing and business planning support along with manufacturing capabilities of volumes up to 100k. The beauty of Genealogy is its relationships with multiple manufacturers, which enables them to match the formula to the manufacturer who is best suited. Genealogy also has close relationships with unique raw material vendors who provide them with a 'first-look' at cutting edge technologies and materials. With speed to market at the forefront of every business, starting out with a fresh concept supported by innovative technology saves internal costs and time in the important creative phase of product development. How fast can we get it?...How is this product different from what's out there already?...How do we make the story simple yet impactful?...How do we stay competitive?... The answers aren't always easy, but they are available. Suppliers, contractors and forecasters are more than happy to help seize the opportunity for innovation in this speed to market environment. We just have to look for it!